Want to know how to make great salsa? This is my favorite salsa recipe. It’s easy to make and can be eaten hot or cold. We grow most of the ingredients in our vegetable garden. Every summer, we can some to enjoy throughout the rest of the year and give away as gifts. Mix all together in a 6 1/2 quart dutch oven or stock pot , bring to a boil. Simmer for 30 minutes. 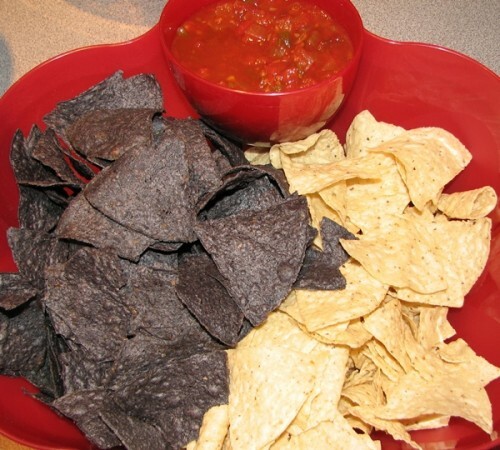 At this point, you can allow it to cool a little or completely (or refrigerate) and eat it warm or cold with tortilla chips, or you could can it for later use. 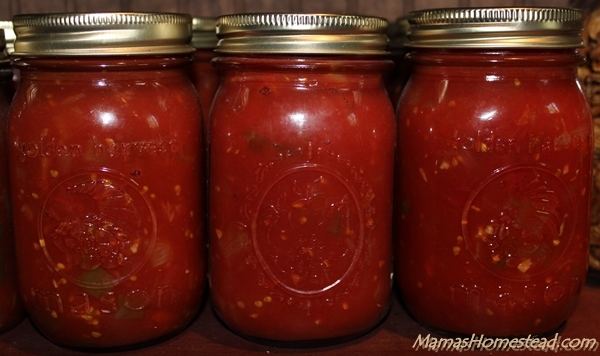 Ladle hot salsa into prepared canning jars to 1/2 inch of the rim of the jar. Use an air bubble remover/headspace tool or non-metallic spatula slid down into the sides of the jar to remove air bubbles. Re-fill the jar to 1/2 inch headspace, if needed. Wipe the rim of your jar with a clean, damp cloth. Food particles caught between the rim of the jar and the lid can cause your jars not to seal. 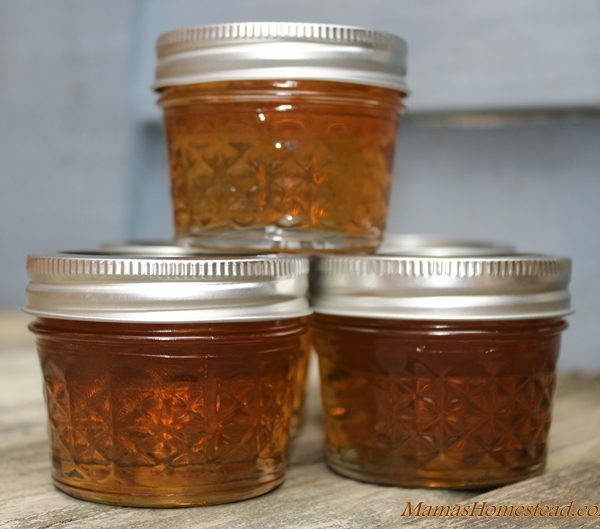 Place your lids onto your jars, making sure the rubber seal meets the jar rim. Screw on the metal band firmly (fingertip tight). Note: Screwing them on too tight may cause them to not seal or to buckle. Use a jar lifter to place your salsa into your water bath canner. Place the lid on the canner. Bring water to a boil. Process in a boiling water bath pints- 15 minutes (time for 1,000 feet above sea level). When the time is complete turn off the heat, remove the canner lid, and allow to cool for five minutes. Remove your salsa from the canner using the jar lifter and place them on a cooling rack or dry kitchen towel two inches apart. Some of the bands may seem loose at this point, do not re-tighten them. After 12 hours, check to see if the jars have sealed, the center of the lid should be concaved and not able to flex. Remove the metal bands/rings and carefully try to pull the lid off with your fingertips to check the seal again. Place any unsealed jars in the refrigerator and use as soon as possible or reprocess starting over with new jars and lids. 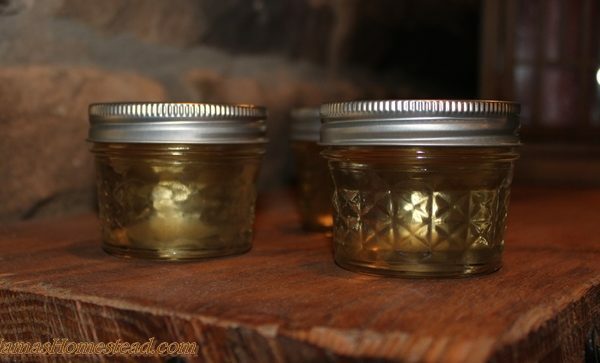 Allow sealed jars to cool for 24 hours. Wash the jars and label them with contents and date. 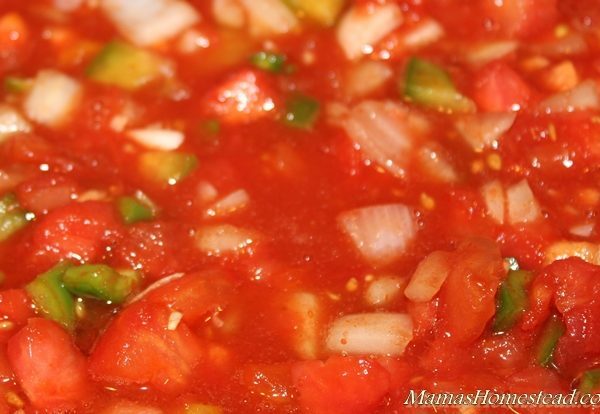 Store canned salsa in a cool, dry place away from light. 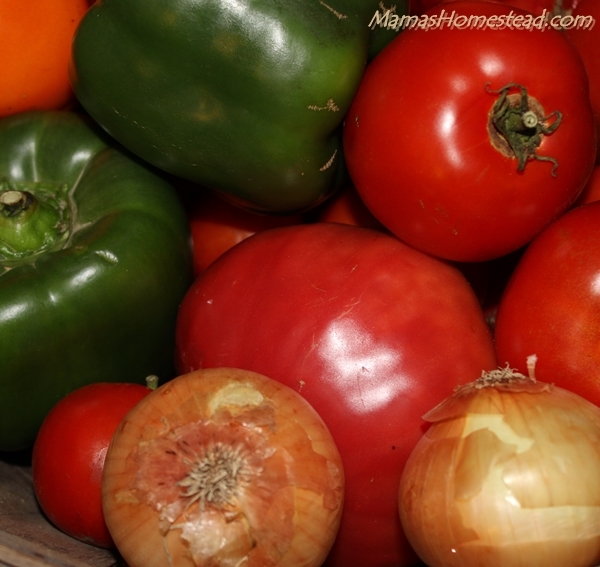 Place tomatoes in boiling (low boil) water. Allow to boil 1 minute. Remove with a slotted spoon and immerse in cold water, cut out the core, peel. The peel will come off very easily. When handling jalapeño peppers, wear rubber gloves to protect your hands. For less spicy salsa, seed the jalapeños before chopping or use less. Want to know how to make salsa? This is my favorite salsa recipe. It's easy to make and can be eaten hot or cold. We grow most of the ingredients in our vegetable garden. Every summer, we can some to enjoy throughout the rest of year. Mix all together in a 6 1/2 quart dutch oven or stock pot, bring to a boil. Simmer for 30 minutes. At this point you can allow it to cool a little or completely (or refrigerate) and eat it warm or cold with tortilla chips, or you could can it for later use. While the salsa is still hot, ladle into clean, hot pint jars, leaving 1/2 inch headspace. Adjust 2-piece caps. Process in a boiling water bath for 15 minutes. Remove from canner to a cooling rack. 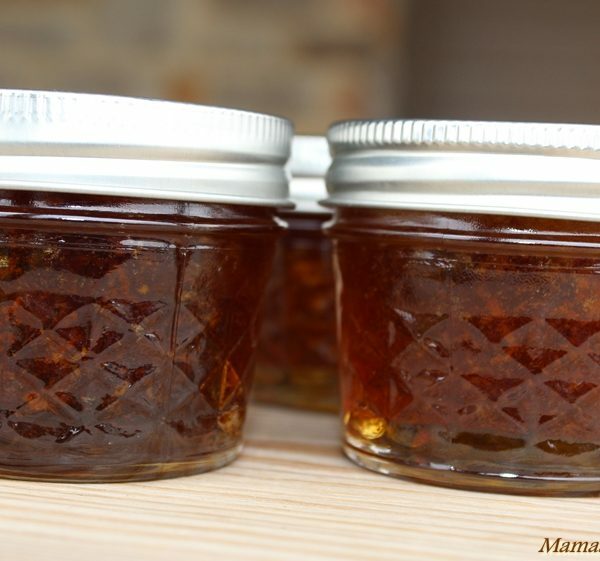 Allow time to seal, refrigerate jars that do not seal and eat within a few days. Place tomatoes in boiling (low boil) water. Allow to boil 1 minute. Remove with a slotted spoon and immerse in cold water, cut out core, peel. The peel will come off very easily.